Gigabit Ethernet vs. 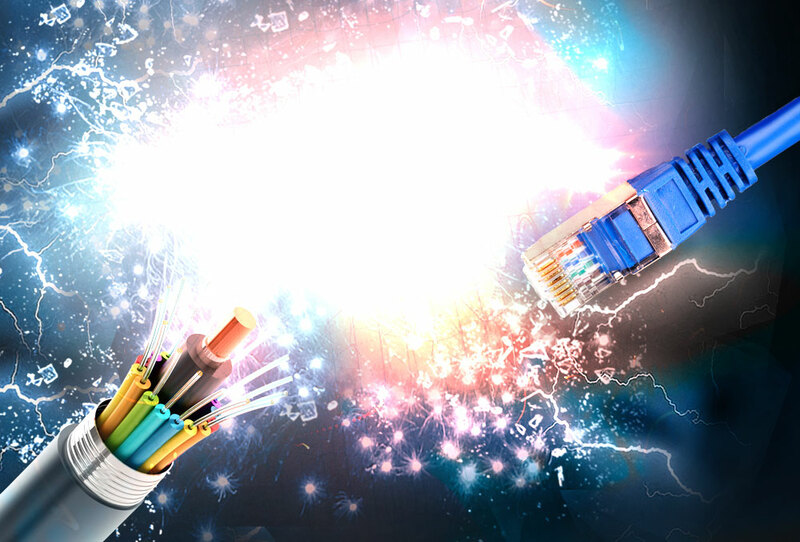 Fiber Optic : Which Is Better? Home / Gigabit Ethernet vs. Fiber Optic : Which Is Better? This high-tech world demands faster rates of data transmission. As a result, data carry methods have evolved beyond the old-school data carriers, copper cables. Nowadays, rapid Data transfers can be accomplished in a variety of ways, with Gigabit Ethernet cable or optical fiber network cables being the most common methods. As a Certified Fiber Optic Technician, you should know the difference. Gigabit Ethernet cables are made up of multiple strands of copper wire that are twisted together to form a cable with four twisted wire pairs per cable. Data is transmitted along these through electrical signals, with two pairs used to send information and two pairs used to receive information. Fiber Optic – How Do They Work? Fiber optic cables are made up of strands of optically pure glass that can be as thin as a human hair. These strands carry digital information via light instead of electrical currents. Strands are arranged in bundles called optical cabling. As we know in the industry, fiber optic network cables are seen by some as the next generation in local area network (LAN) cabling. Although fiber optic network cables have clear advantages over copper wiring, smaller networks that are used for less intense computing may not immediately benefit from these types of cables. Optical fiber transmits at a more rapid rate than copper Ethernet cable. A single optical fiber strand has been used to transmit data at a rate of 100 Terabits per second. Fiber optic cable is more effective over longer distances due to the technology used to transmit data. Although signal degrades over distance with both technologies, the degradation is significantly less in fiber optic cabling. Fiber optic strands can be as thin as human hair and are significantly lighter than their copper Ethernet counterparts. Ethernet network cable works through electrical signal, making it more prone to radio frequency and electromagnetic interference, especially in longer cables or cables that are bundled with other copper cables. As fiber optic cables work through the transmission of light, light signals travelling along one strand will not interfere with the signals in other strands in the same cable. Fiber optic cabling is often used in areas where copper cabling suffers interference from electronic devices or where protection is needed from interference. For home networking applications, Gigabit Ethernet cable may be a cheaper option than optical fiber. However, considering the amount used in long distances, fiber optic is usually cheaper than copper cable, but the electronics needed to make fiber optic work can be costly. Most computers are equipped with Ethernet network interface cards, and replacing these with optical fiber compatible cards will add significantly to the cost of using optical fiber. However, as it is starting to be more common, the price of fiber optic cable is going down. Even though fiber optic cabling is superior to gigabit Ethernet cabling in a number of ways, a home network may not benefit significantly from this technology when one takes the costs associated with an optical fiber network into account. This does not relate only to the cost of the cable itself, but takes into account components, equipment and software necessary to upgrade the network. In business or industrial settings, however, fiber optic cables could improve network performance significantly balancing out any additional costs.